On March 30th, R. Remillard, et al. 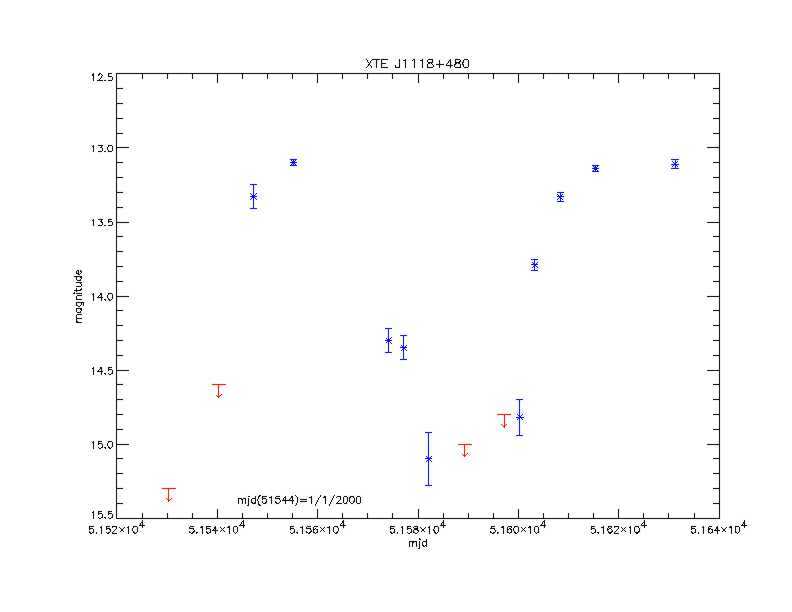 reported the observation of a new X-ray source, XTE J1118+480, detected by the RXTE All-Sky Monitor (IAU Circular 7389). With retrospective data analysis, they found this object to have slowly risen in intensity since March 5th with earlier flares recorded in January. Analysis of sky patrol images obtained by the ROTSE-I camera array shows that this object varys significantly at optical wavelengths as well. Images obtained at 54 epochs from January 4, 2000 through March 28, 2000 have now been analyzed, showing a strong correlation of optical intensity with the x-ray fluxes observed by RXTE. The resulting light curve is shown in the figure below. This retrospective analysis is being carried farther backward in time as we retrieve images from our two-year archival database. Click here to see graph in larger detail. A search of USNO-scanned Palomar plates shows no evidence for this object at eight different epochs spanning 1950 to 1997. A ROTSE-I image of XTE J1118+480 shows the transient in roughly the center of the frame with a small circle drawn around the expected location. That image can be compared with a Palomar image taken in 1953. The bright star in the Palomar print corresponds to the bright star just slightly left of center in the ROTSE-I image. These recent ROTSE results have been distributed as IAU Circular 7394 //cfa-www.harvard.edu/iauc/RecentIAUCs.html. Our search for gamma ray burst optical counterparts in six of our ROTSE-I triggered bursts was accepted by ApJ Letters (astro-ph/0001438). No optical counterparts were observed, implying that optical and gamma ray emission are not strongly correlated. A preliminary version of these results was submitted to the Space Telescope Science Institute's 1999 May Symposium (astro-ph/9909219), and this paper is useful as a hardware and operations reference for the experiment. We also have submitted a paper on SGR's at the Huntsville GRB Symposium last fall. These results are being finalized for refereed publication. Our first ROTSE-I catalog of regular and long period variables has been accepted for publication in AJ April, 2000 (astro-ph/0001388). Approximately 5% of the sky was studied down to magnitude 15.5 revealing about 1600 new variables, including many new RR Lyraes. In collaboration with J. Zinn et al., our 1998 Leonids results were published in Meteoritics and Planetary Science 34, 1007-1015 (1999). ROTSE is an experimental program to search for astrophysical optical transients on time scales of a fraction of a second to a few hours. This is an area of astronomical science that has been relatively unexplored until now. The primary incentive for this research is to find the optical counterparts of gamma-ray bursts (GRBs). These mysterious events are manifested by brief (~10 seconds) intense flashes of gamma-rays with typical photon energies of the order of 1 MeV. The ROTSE project is designed and operated by a collaboration of astrophysicists from the Los Alamos National Laboratory, Lawrence Livermore National Laboratory and the University of Michigan. Since March 1998, we have logged over 1.2 Terabytes of sky images which are being studied for a variety of astrophysical phenomena. The ROTSE research program is supported by NASA, NSF, the Research Corporation, The Planetary Society and the participating institutions. This page has been accessed times since December 16, 1996. Last updated: February 8, 2001. Web curator: Tina Wells, tmwells@umich.edu.